GAR Consultation - if you fly overseas this needs your attention! 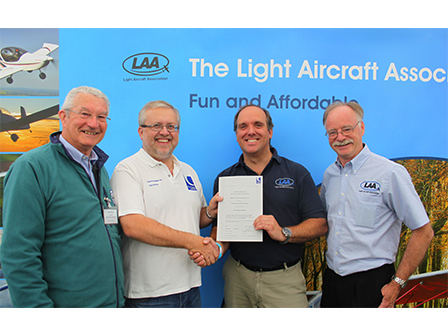 Jon Cooke, Chairman of the LAA Pilot Coaching Scheme, receives the CAA Certificate from Mark Shortman of the CAA General Aviation Unit, flanked by LAA Chairman Brian Davies (left) and LAA CEO Steve Slater (right). (Image rights-free if credited to Paul Morton/LAA). The new LAA Wings Award Scheme has been endorsed by the UK Civil Aviation Authority in accordance with the Pilot Recognition for Operational Up-skilling and Development (PROUD) scheme. Announced at the LAA Rally at Sywell on Saturday 5th September, the new initiative from the LAA Pilot Coaching Scheme is designed to improve the skill levels of private pilots by encouraging life-long learning for members and other pilots, as a route to helping improve safety. One of the key drivers of the CAA PROUD initiative is to close individual skills gaps and also to help tackle the high ‘drop-out’ rate amongst recently qualified PPLs, many of whom lack confidence and motivation. The LAA Wings scheme encourages the development of pilot knowledge, skills and attitudes by offering a series of challenges and activities to broaden pilots’ activities and interests; create additional skills via further training and qualification, encourage personal development and flight safety awareness, and set extended navigational challenges. The LAA Wings award scheme is open to all qualified pilots of aeroplanes or rotorcraft whether an LAA member or not, and support will be provided by members of the LAA Pilot Coaching Scheme. There are three categories of LAA Wings award against which criteria are set. Each award requires completion of Minimum Flight Times, Achievements, Safety Event Attendance and an Extended Navigational Challenge to gain the requisite Bronze, Silver, or Gold Wings. Pilots can start their LAA Wings adventure with training toward Bronze Wings as soon as they qualify, with a view to applying for their wings when they have gained 100 hours flight time. Among the achievements required will be a cross-country flight of 200nm with two intermediate stops.